Problem: TFT involves tapping on specific points in a very precise order. 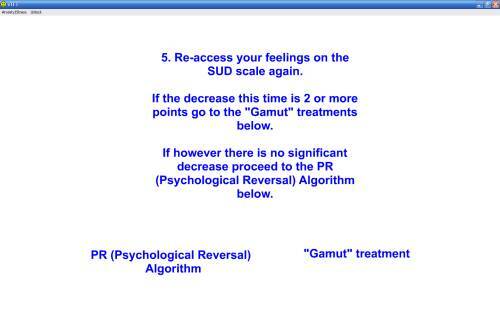 There are three main "algorithms" or sets of tapping that apply to anxiety/stress, traumas and depression. The logic in terms of what to do and when can sometimes be a little confusing. Solution: Visual TFT resolves this issue by visually and interactively guiding the user through the entire process. The Visual TFT software utility guides a user through the often complex process of tapping on specific points. The interactive instructions are contained within 30+ different screens that show the user exactly what to do and when. 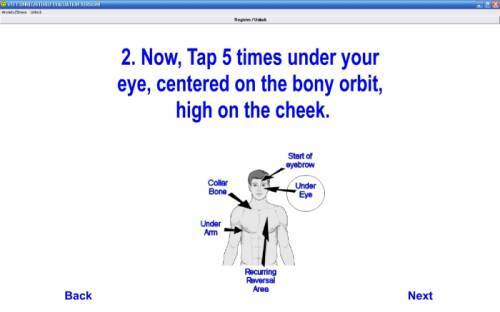 This software utility guides the user logically through the tapping process to remove stress and anxiety. Available as part of the Therapists Toolkit for Macs. What about ongoing support and upgrades? Installation support is UK based, free of charge and available by eMail. Updates are free of charge. How do use Dynamic TFT? It may also be useful with the treatment of panic attacks / agoraphobia, the treatment of phobias and fears, the treatment of addictions and habits and in the treatment of trauma / PTSD. By cheque: Complete an order form and send to us in the post with your cheque.